When you think of your exes, you probably have mixed feelings. Some of them may evoke negative feelings of strong distaste and you’re happy to not be associated with them anymore, while others might still hold onto a piece of your heart. But do you ever think about getting back together with your ex? You probably broke up for a reason, but since humans crave attachment, you may be quick to jump at the opportunity to get back together with your former love. It’s easy and convenient because you already know and are comfortable with each other and you are familiar with how they act. It?s possible to have a successful relationship the second time around with someone, but you need to approach it in the right way. Here are a few tips on getting back with your ex without creating a lot of drama. Reestablish your friendship before jumping back in where you left off. Don’t be so quick to add a label to the relationship again. Recognize what you need in order to be happy in a relationship. What are your expectations and what qualities do you want in a partner? What are your deal breakers? Talk about these things open with your partner. It is important to be honest about what you need and want out of a relationship so the two of you don’t end up back in your old patterns. You already know each other because you dated in the past, but people change in time. Get to know your ex again by asking questions and seeing how they feel and their methods of thinking. Couples should build on their past relationship, even the parts that went sour. You want to make sure that your partner’s values and attitudes match yours, because this will make you more likely to stay together. Even if you have different hobbies and interests, your underlying values should line up. You need to have a conversation about the dating experiences you both had while you were apart. Did either of you have a serious relationship? Details aren’t needed here– but you especially need to let each other know if you dated someone that is a mutual friend in any way. You want to mention these things so you don’t run into surprises in the future. If one of you gets upset about it– even though you weren’t a couple, you should address those concerns and move past them. Have you not had any luck in the dating world since breaking up with your ex or do you genuinely believe there is something positive that is worth going after with your ex? If you are just using your ex as a backup, that isn’t a good or healthy reason to get back together. But if you really think that the two of you had something special, it is worth considering. If the two of you tended to set aside some serious issues last time you were a couple, it?s important to stop doing this. Maybe you ignored red flags last time because you figured things would change or you didn’t truly know what you wanted. During round two with this person, make sure to trust your instincts before things go downhill. Old fights and issues that you two had will surface again, so you want to get to them before they get to you. Discuss the issues that led to your disagreements and the things you can do to avoid these fights in the future. Discussing these things when you?re both calm is important because you?re more likely to have a constructive conversation. You want to build on your former relationship. Your trust has probably been broken at some point since the two of you ended your relationship. Once trust is broken, it is tough to build it up again. It is common to fall back into old habits when you get back together with an ex. Because of this, it is important to discuss what it means to each of you to have a trusting relationship and lay out your expectations for each other and for the relationship. Talk about how you each feel about commitment and make sure you are on the same page. 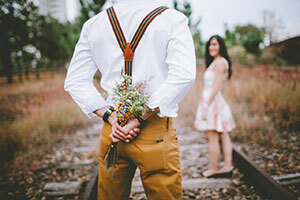 Getting back together with an ex may end in the same breakup you once had, but if the two of you have grown and are able to approach the relationship in a new way, it may end with a positive outcome.